Whether you are an adventurer in search of under-the-radar destinations, or a mountain lover looking for an alternative beyond the classic routes, Kyrgyzstan should definitely be on your bucket list. Impressive mountains and a fascinating culture make this Central Asian country a unique place to discover together with a local mountain guide. This is exactly what Yurihahn experienced last September, when he enjoyed a mountaineering and hiking adventure that Andrey designed just for him. Yurihahn is a 29 year old man from Singapore. 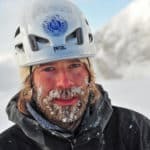 On March 2016, he came on Explore-Share.com with the idea of heading to a less-traveled destination, where he could practice mountaineering and improve his climbing skills. Although he usually went climbing to indoor walls (from 6a to 6b) he didn’t have much experience climbing outdoors, except for a previous trip to Krabi and Chiang Mai, in Thailand. After considering different travel options, Yurihahn decided to venture on a 10-day trip to an unusual destination: Kyrgyzstan. A great rock climbing spot! Kyrgyzstan is a small republic almost entirely covered by mountains. The Tian Shan mountains occupy around 80% of the country, with huge snowy peaks over 7000 meters. In ancient times, this territory was part of the Silk Road. Then, it belonged to the Soviet Union until its recent independence, in 1991. Nowadays, Kyrgyzstan is slowly turning into an emerging travel destination, with many attractive options for travelers and outdoor activities enthusiasts. In fact, the Business Insider chose it as the top travel destination for 2016. Unspoiled mountains, gorges, waterfalls and glaciers, make it a paradise for adventurers. Besides, it has the second largest alpine lake in the world: the beautiful Issykul lake. But beyond the natural features, it’s the warmth and kindness of Kyrgyz people what make this trip a worthwhile experience. For his trip to Central Asia, Yurihahn contacted Andrey Erokhin, a Kyrgyz certified mountain guide (KMGA) who offers different trips around his country through his Explore-Share profile page. 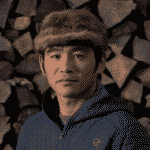 “When I prepared a program for Yurihahn, the first thing I wanted to show him was the contrast of Kyrgyzstan mountains. That’s why we had a great adventure starting from the snow-capped mountains of Ala-Too, then following the ancient Silk Road through the canyons of Konorchek and finally reaching the hospitable shores of Issykul lake”. The trip took place in September 2016. The first day, they went from the airport to Ala Archa National Park, where they spent 6 days. They practiced multi-pitch climbing and ascended several peaks. Besides, Yurihahn received training on the ice and learned the basic skills for technical climbing. You can take a look at the program that Andrey offers in this amazing mountaineering area. “Everything about the program was great: it actually was my first hike, trek and climb on a mountain! Perhaps I wasn’t physically prepared, but reaching the top of the peak was definitely the best part of the trip. I also enjoyed doing multipitches on the mountain, that’s something I would really like to do again”. It was hard for him to cope with cold temperatures and low humidity (“my lips were really chapped and my skin burnt”), but he didn’t let that discourage him. The trip continued with a small city tour in Bishkek, Kyrgyzstan’s capital. Then, they went to Issykul lake, stopping along the way in different places, like the ‘Konorchek canyons’. Along the north shore of this large lake, they could see the cultural historical center ‘Ruhordo’. They also visited the town of Karakol, another important trekking destination of the country. Following the south coast, they passed through the nice valley of ‘Jetyoguz’, where they camped for the night. On their last day, they enjoyed swimming in the lake and finally returned to Bishkek. Once back, Yurihahn started planning his next trip: a Climbing Traverse in the Pyrenees for next summer, together with Roger! 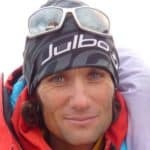 Andrey is a certified mountain guide since 2004. He organizes trips in Kyrgyzstan, China, Russia and Kazakhstan. In fact, he offers more than 100 different ascents for every climbing level. One of them is climbing Lenin Peak (7134m), one of the easiest ascents over 7000 meters. Traveling with a local guide is a unique adventure. It allows you to visit unusual destinations and connect with people and their culture in a very special way. At Explore-Share we value the work of local mountain guides. That’s why we enable them to propose original itineraries beyond the classic spots. Besides, we provide clients direct access to qualified mountain guides, so they can discuss and define a program together. Are you planning your next adventure? We hope Yurihnahn’s experience to be inspiring, and encourage you to go off-the-beaten-paths for an incredible adventure too. Kyrgyzstan and its wonderful people are waiting for you!